It’s my favourite time of year! I’ve loved the Christmas season since I was a child. It’s almost magical. From the twinkling lights on homes to the soft glow of my decorated tree, Christmas is a special time of year. The most important part of the season, in my opinion, is being with family. Some of our relatives live very far away so their annual holiday visit is something I look forward to all year long. Needless to say, I enjoy hosting these family gatherings and put a lot of effort into planning them. I make sure the house is neat as a pin, nicely decorated and I have lots of delicious food to feed my guests. Since my family and friends see me sharing recipes all year long on social media, they would expect nothing less. I need to make sure I live up to their high expectations! 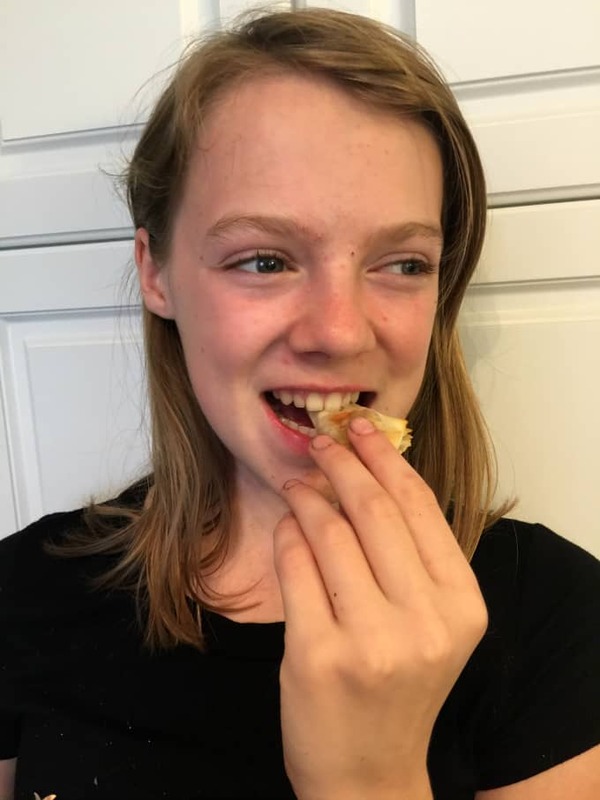 That said, this year I’m adding a delicious appetizer recipe from Walmart to my holiday menu – Avocado Toast Pockets – and they are sure to impress my guests. Walmart has loads of yummy holiday appetizer ideas, making my planning process that much simpler. Bonus points that many of their recipes can be made for less than $1 per serving. 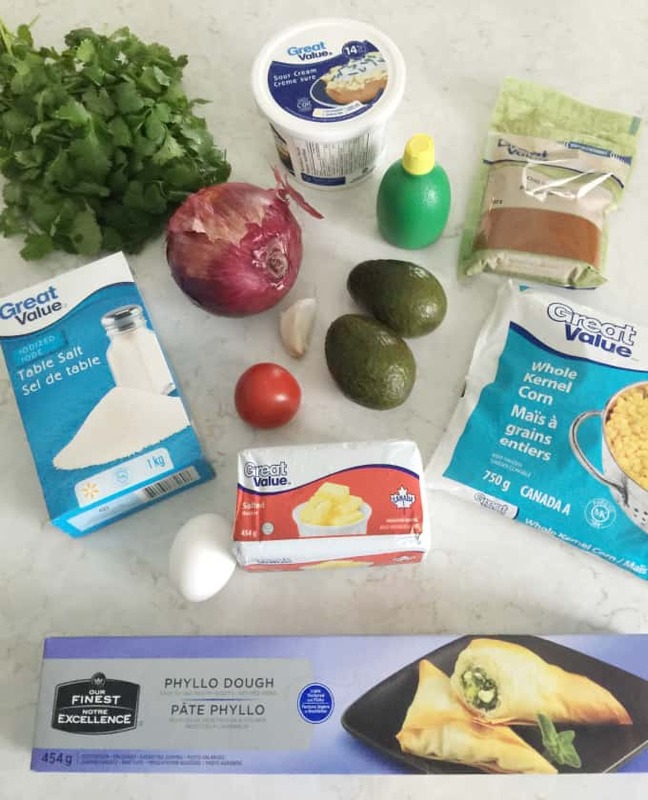 I picked up all the ingredients I needed to make this easy appetizer at my local Walmart Supercentre. I can always count on them to have fresh, high quality ingredients. The filling for these Avocado Toast Pockets is made up of avocado (obviously! ), tomato, corn, red onion, lime juice, chili powder, garlic and salt. I love the southwest flare of this fresh combination! 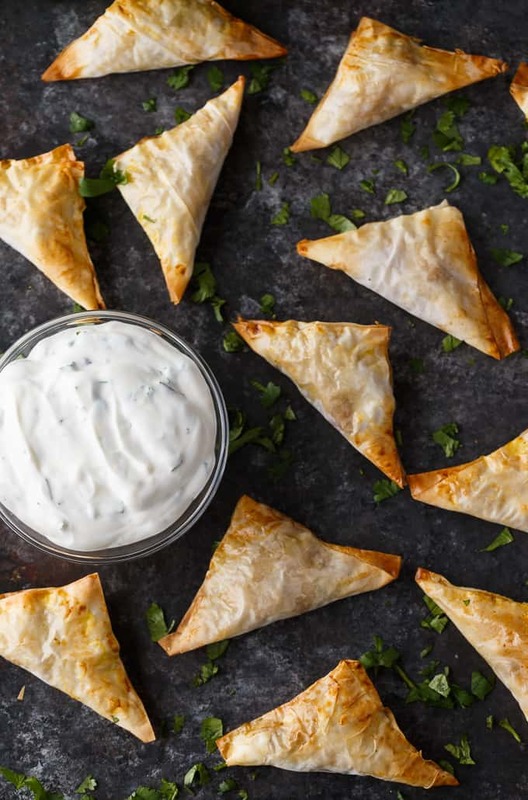 The “pockets” are made from sheets of phyllo pastry. I haven’t worked a lot with phyllo pastry before and was pleasantly surprised at how easy they were to work with. I used the top of the phyllo pastry box to measure out my strips. After cutting my phyllo pastry into squares, I added the veggie filling to each one. This task could be something the kids could help you with. Brush the edges with egg wash so your pockets will stick together. The fold up nicely into bite sized triangles. Brush the top with more egg wash to give them a golden sheen. They only need to bake for about 10 minutes. If you are hosting a party, prepare them the night before up until you are ready to bake. Then, all you have to do at your party is pop them in the oven. They taste the best served fresh out of the oven. The dipping sauce is the perfect complement. It’s made with sour cream, lime juice, garlic, salt and fresh cilantro. 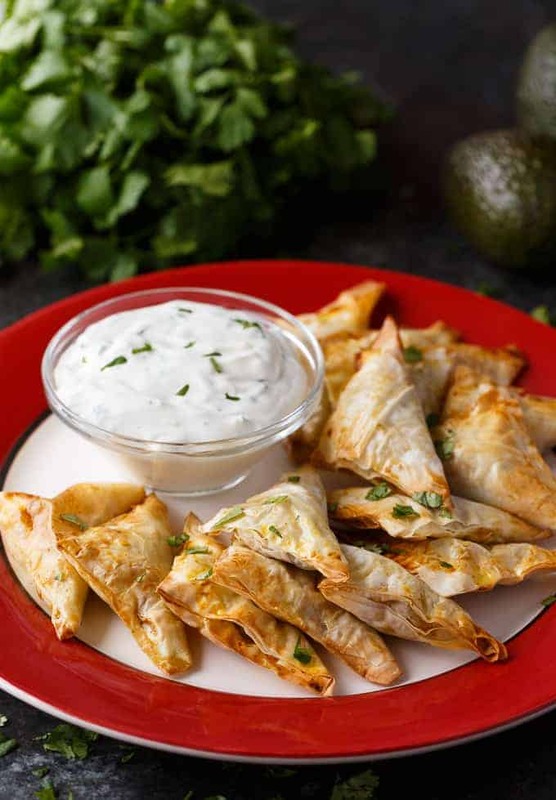 The Avocado Toast Pockets have some kick to them so the dipping sauce will cool it down a bit. I was tempted to “double dip” because it was so good, but I held myself back for my family’s sake. I knew they wanted to enjoy the dipping sauce, too! Each bite is bursting with mouthwatering flavour. I love the different textures from the flaky outer pocket to the spicy veggie filling. My aunt was over when I was making them and we were surprised at how yummy they were. She asked me for the recipe so she could make them at her own holiday parties. In fact, my aunt, daughter and I ate this entire plate. Once you start eating them, you can’t stop. That’s how I know I have a keeper on my hands. I was surprised that Bridget enjoyed them as much as she did. Miss Picky Eater often turns her nose up at my recipes, but will try them at least once thankfully. She said her favourite part was the crispy phyllo pastry. You can find all the ingredients to make these scrumptious Avocado Toast Pockets at your local Walmart Supercentre or online at Walmart.ca. You could even pick them up when you’re there shopping for holiday gifts. I love that Walmart is a one-stop -shop. If you’re short on time, try Walmart’s Grocery Pickup. You can select your groceries online or via the Walmart app and they’ll be loaded right into your trunk at your selected store. Talk about convenience! If you try this recipe, I’d love to hear your thoughts. What appetizers are on your holiday menu? An impressive holiday bite-sized appetizer packed with spicy southwestern flavour. Heat oven to 375F (190C). Line two rimmed baking sheets with parchment. 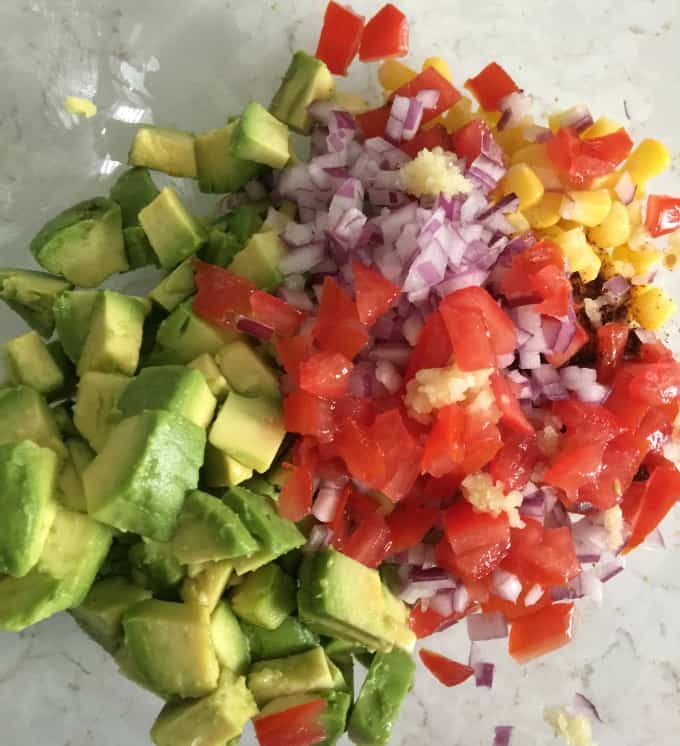 Stir together avocado, tomato, corn, red onion, 2 tsp lime juice, chili powder, half of garlic and 1/4 tsp salt in a medium bowl. 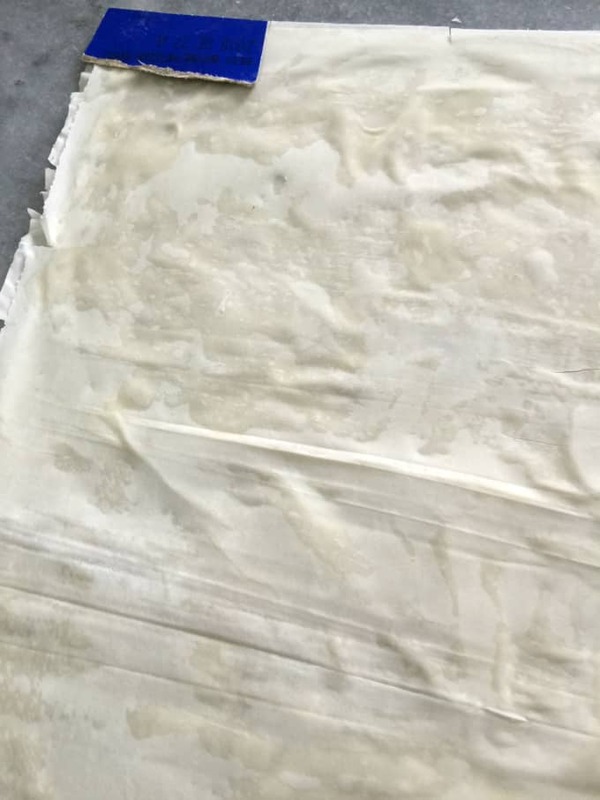 On a clean counter top, place one sheet of pastry. Brush evenly with butter and top with another sheet, smoothing to flatten. Brush second sheet with butter and top with a third sheet. Cut sheet along the long edge into 5 even strips. Cut each strip in half crosswise and half again to make 4, 3-inch squares. Repeat with remaining strips. Fill one half of each square with 1 tbsp filling, leaving a 1/2-inch border. Brush border with egg wash. Fold pointed edge of unfilled half over to create a triangle and press firmly to adhere to egg washed edges. 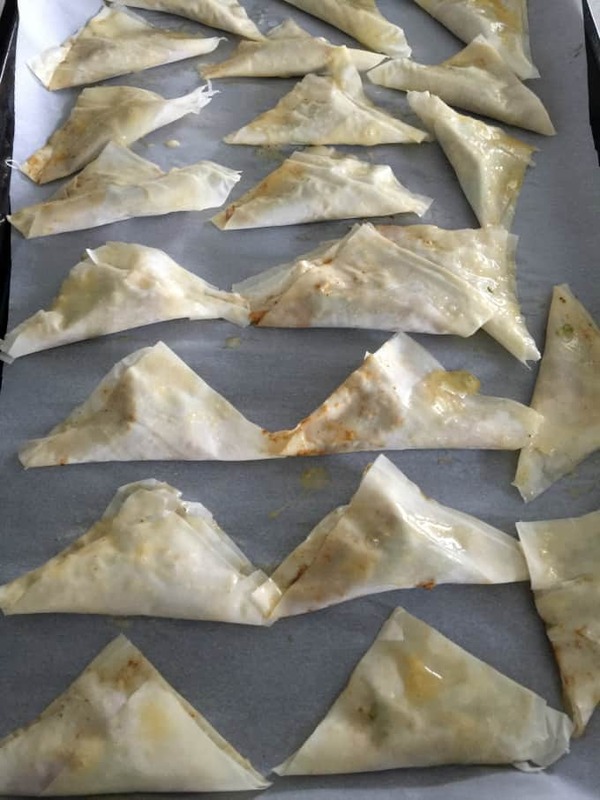 Place on prepared sheet and brush triangles with egg wash. Bake until golden, about 10 minutes. Repeat with remaining pastry sheets and filling. Meanwhile, mix sour cream, cilantro, remaining lime juice, garlic and salt in a small bowl. Serve with pockets. If you enjoy a little spice, stir 1/4 tsp cayenne pepper or your favourite hot sauce into dipping sauce. Phyllo pastry likes to dry out quickly. While brushing pastry with butter, keep not yet used sheets covered with clean, dampened kitchen towel. Disclosure: This post is sponsored by Walmart Canada as part of the Walmart Canada Amazing Apps program. In exchange for this post, I have received perks in the form of products and compensation. All opinions on this blog are my own. I’d love to try these. They sound delicious. LOVE it! I didn’t even like avocados until about a year ago and now I can’t get enough. These pockets sound SO good! Those look AH-mazing! I love that “junky” feel from a food that’s actually healthy. I can’t wait to make these! Oh my gosh. You had me at avocado. This is so creative and the final product looks simply AMAZING! My mouth is watering for reals right now! I’ve never used phyllo pastry before, I’m glad to hear your experience was a good one. I love the filling mixture in this. When I saw “avocado toast” I figured it was mostly just avocado, but there’s a ton of stuff going on here! We love the southwest flavors around here, so these would definitely be a hit! These look really tasty. My kids love to have things like this for dinner, they love it when I put out a plate of appetizers They feel like they’re at a restaurant and not really having dinner. Oh my goodness! 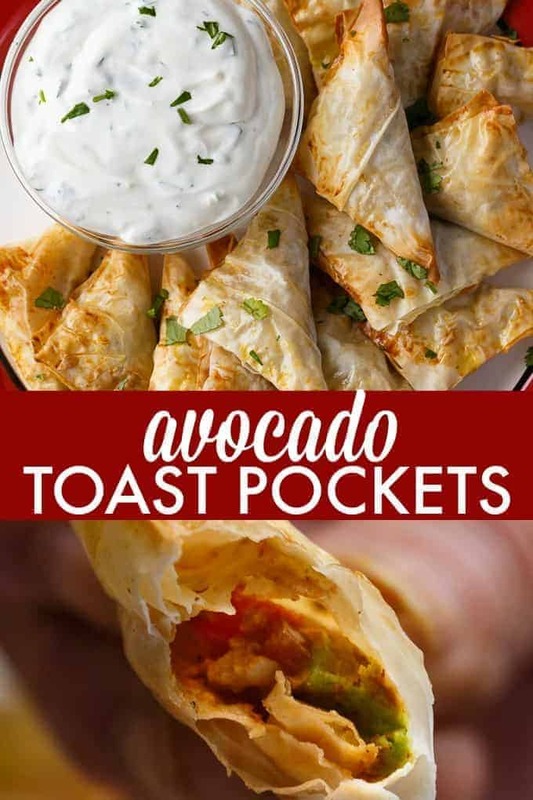 Avocado Toast Pockets? They look absolutely delicious. 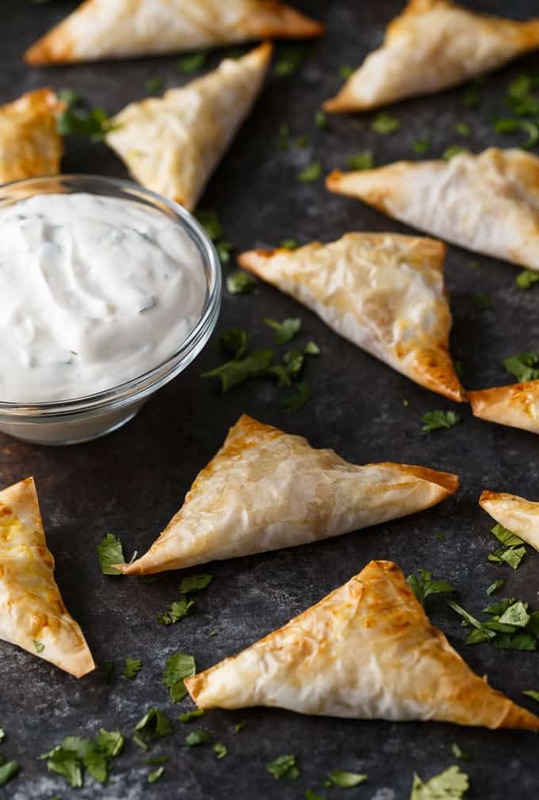 I love phyllo pastry and all the wonderful things you can make with it. Those look so amazing! I’m saving the recipe. Great Value products save a ton of money when entertaining. YUM! Oh these look like delicious appetizers. I would love to give these a try! I love avocado anything! These look like they would be packed with so much flavor. Those pastry sheet pockets rock. I love avocado and I really need to have it in my meals more often. These look so amazing. I love that you used avocado. It’s great for so many things and tastes really good too. These remind me of some avocado egg rolls I had at a restaurant once. They were so good. Those look really good and remind me of rangoons. I love avocado and need to try them. These look super delicious. I would definitely make these at home! These are such a great idea! I love how perfect they are for small hands, too! Yay another delicious appetizer to add to my menu this weekend my guest should be raving on Monday. This sounds amazing! I love anything with avocado. Perfect breakfast and healthy! Our whole family LOVES avocados and we always have some in the fridge. I can’t wait to make your avocado toast pocket recipe, it looks absolutely divine. This looks really good! I love how easy these are to make! Such a perfect party food! Yum, yum, and yum again! These look delicious and these flaky babies look amazing. I am loving the southwestern flavor of these. I need to add these to my holiday menu. 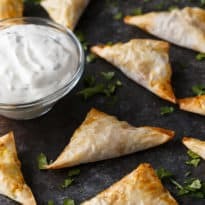 These are great appetizer pockets! Hope you have a great week and thanks so much for sharing with us at Full Plate Thursday. The filling sounds yummy! 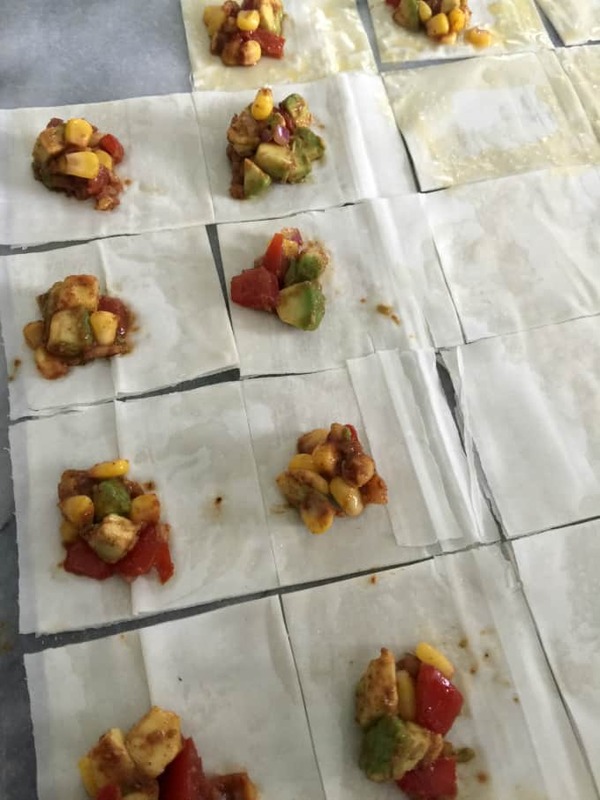 Have you tried wrapping them in traditional samosa style? I’m not very good at it, but my boyfriend wraps them really well and it keeps all the filling inside without having to seal it! These look soo delish Stacie! I’m not familiar with working with phyllo pastry either, but have heard it’s easy, even before you said it. Pinned for future reference. I can see why your house is the go-to for your family at Christmas. The pockets look really good! 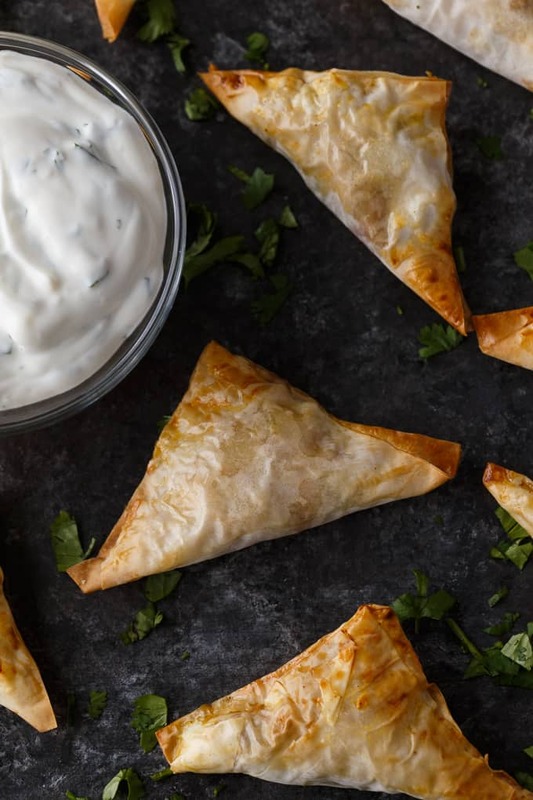 I’m not a sour cream fan but I’m thinking they’d be good with Tzatziki too… Thanks!